Beep beep! There's a Traffic Jam℠ ride! 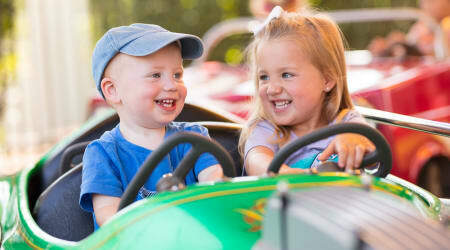 Children can ride motorcycles, cars, and buses around the circle at a low speed. Traffic Jam is located in the Founder's Way℠ region of Hersheypark®. One taller companion may accompany each child: that includes mom or dad. This ride only seats four guests taller than the HERSHEY'S milk chocolate bar height category and they must sit in the fire trucks.